Could Your Dry, Itchy Skin Be Linked to Your Water? There is nothing like taking a shower or bath after a long, difficult day. Whether you work in a stuffy office or you work with your hands all day long, feeling pure, clean water cascading and washing away the day’s stresses can be extremely refreshing. While showers and baths are refreshing, have you noticed that your skin has felt drier or itchier? Perhaps when you do dishes, you notice that you have to put extra moisturizer on afterward. You might even notice that your hair is drier or even your scalp is itchier. Do you also notice that your sink, bathtub, or shower glass has scaly residue left on it after being exposed to water? After years of water use, do you notice that your water pressure is slowly decreasing for apparently no reason? For people who have no previous history of dermatological conditions, suddenly having dry skin every time you use water can be alarming. However, for most folks, they don’t realize that the issue may stem from the actual quality and mineral content of their water. Itchy, dry skin doesn’t have to be the new normal for you. At Home Water Solutions in Northern Colorado and Idaho, we believe that water hardness can be a threat to your skin’s health. Whether you know the mineral content of your water or you have never had your water quality tested, Home Water Solutions is here to help you. We install whole house water filters that will ensure your skin and hair doesn’t dry out due to high mineral content in your water. Today, we will be talking about different components of your water that lead to dry, itchy skin. We will also look at different solutions so that you can regain your healthy, smooth skin. If you want to learn more about Whole House Water Filters for your Northern Colorado or Idaho home, be sure to visit Home Water Solutions today and get a free water quality test today! The term “hardness” as it pertains to water quality describes the mineral content in water. If you have water that is high in mineral content, you have hard water; meanwhile, water that has few minerals is labeled as “soft.” Both types of water have different advantages and applications; however, they also have drawbacks. The minerals and concentrations of minerals that are actually in water depend on where you are in the world. By examining the United States Geological Survey’s water hardness map, you can see that most of Northern Colorado, Wyoming, and Idaho have exceptionally high mineral content in the water. The actual mineral content of the water also depends on where you are. Because water either comes from underground aquifers or flows through rivers and streams, it accumulates minerals from the earth’s terrain. These minerals include calcium and magnesium carbonate, bicarbonates, sulfates, and chlorides. When you shower or use hard water, the minerals in the water have the potential to dry out your skin and lead to more problems such as dermatitis, acne, and eczema. When hard water reacts with soap, it can actually form salts that will continue to dry out your skin well after you use the water. Because the hard water doesn’t effectively dissolve soap, the soap stays on your skin in a slightly different chemical form that is prone to clogging pores and irritating the skin further. This leads to conditions such as acne and eczema because your skin is essentially not being cleaned properly. Water hardness is also important to monitor if you live in a dry climate with low humidity. 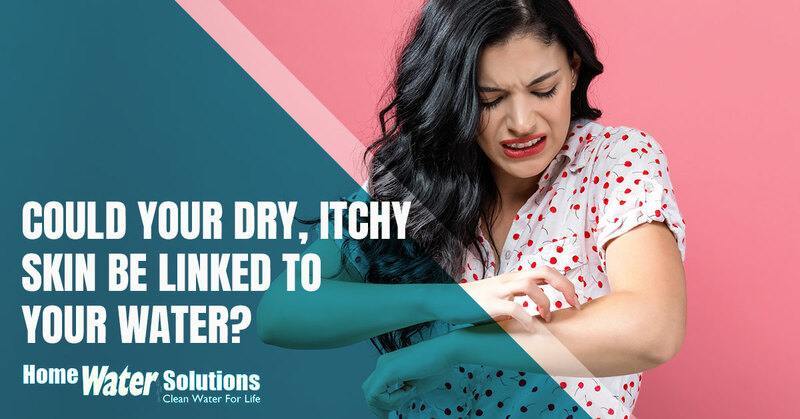 Because the skin is already susceptible to drying out in these regions, if you have hard water you won’t be able to properly moisturize the skin. There are many different options that can remedy your water’s hardness. One of the cheapest, although not nearly as effective solutions, is to purchase a shower head that can filter out some of the minerals in your water. These shower heads need to be replaced frequently and are not a good long-term solution. Alternatively, you could install a whole house water filter that will eliminate most mineral content in your water beyond just the shower. That way, when you use your water to wash your hands or dishes, you don’t end up with dry, cracked hands or scaly dishes. There are plenty of other benefits to using a whole house water filter besides just making your skin healthier. If you want to learn more about the benefits of a whole house water filter from Home Water Solutions, be sure to visit our website today. Act quickly and you can also get a free water quality test for your home by visiting this page!